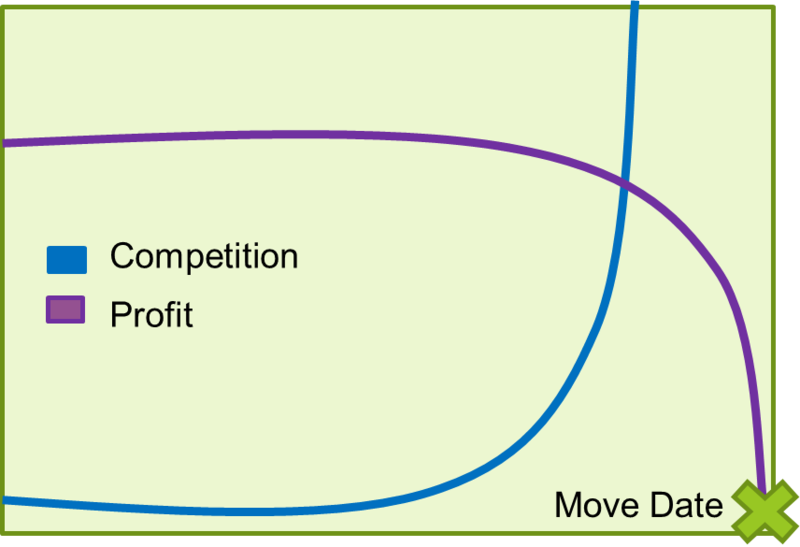 Want to minimize the competition and maximize profits? Get to the office move early! Everyone who didn’t buy Apple stock back in in the early 2000s when the price dipped to less than $2 a share understands just how frustrating it can be to arrive to a deal too late. Sure, you can be the proud owner of Apple stocks now, for over $100 a share, but your profit margins stand to be a lot lower if you purchase at this price. Similarly, waiting too long to approach a prospect before an upcoming move can lead to shrinking profit margins. After all, your prospect will have sought bids from various competitors, and there won’t be enough time to enter as a consultant and prove the value of your services at a higher price. To win the deal, you’ll have to undersell your services, cutting into your profits. It’s pretty clear that timing is everything, whether you’re investing in the stock market or trying to sell moving services. But many salespeople don’t realize just how early you’ll need to approach the customer in order to retain your profit margins. Today’s busy prospects tend to wait until the last minute to start planning for their upcoming move or growth initiative. Whether they need relocation services, new computers, or break room furniture, they’re going to do the same thing: turn to the internet a month or so prior to their deadline and seek bids from various vendors. At that point, the biggest customer value is price, since they’ll want to get the best deal they possibly can at the last minute. The prospect doesn’t care what additional value you can bring to the table, like your extensive experience helping similar companies to plan their office moves. You can’t compete with the ease of shopping for vendors online…unless you introduced yourself to your prospect six months before. What, that early? It may seem counterintuitive, but approaching a prospect before they have even identified a particular need is exactly what you need to do to enter as a consultant. Here’s an example. Say you offer IT relocation services, and you find out that a prospect is planning a move. The move date is 8 months away, and many of the employees at the company may not even know about it yet. You can be pretty sure that the person in charge of planning the move is not thinking about the safe relocation of company IT equipment. That’s where you come in, introduce the need, and explain that the services of an IT relocation specialist during a move can prevent the damage of critical equipment and, worse, data loss that can bankrupt an organization. Even when the move is a couple of months away and your competitors start approaching the prospect, you’ll have the advantage, because you were there from the beginning. You built a relationship with the prospect and gave them helpful information for planning a successful move. Unlike playing the stocks, getting in early on a trigger event such as an office relocation almost always leads to Apple-like success. There are few risks to getting in early on a deal, and you’ll be repaid with customer relationships that are more valuable than last-minute internet sales. Talk to us about how Wendover can help you identify opportunities while there is still time to influence the buying decision! We have been helping customers get in early for over 25 years.